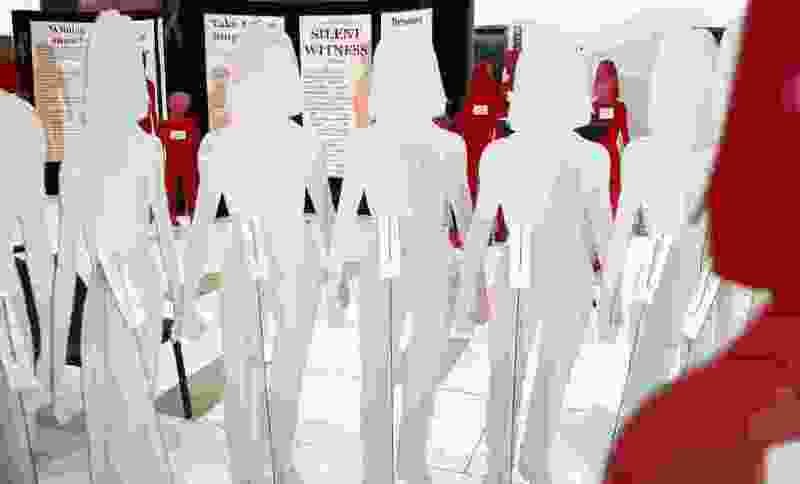 (Leah Hogsten | The Salt Lake Tribune) Life-sized, red metal silhouettes serve as a reminder of victims of domestic-violence homicides during West Valley City's domestic violence-awareness march and reception at City Hall. As Utahns we have historically prided ourselves on the fact that we are a “Family Values” state. However, I often find myself asking, Why don’t our actions match our words? According to the Utah State Department of Health, two in 11 women and one in 10 men in our state will experience intimate partner violence at some point in their life. Rates of violence for trans and non-binary individuals are even higher, with more than half of this population reporting experiences of intimate partner violence, according to a 2015 survey by the National Resource Center on Domestic Violence. Intimate partner violence has been shown to create lasting health consequences for survivors, particularly for children who witness these incidents. Despite these statistics, Utah’s political handling of domestic violence is deeply fractured. Although we have recently experienced significant strides in areas like prosecution, evidence handling, victim advocacy and support and increased public awareness, Utah still has one of the worst records for domestic violence in the United States. We are better than this. As a Murray city prosecutor, I see every day the real impact domestic violence has on our families, our neighbors and our state. Witnessing the human cost is heartbreaking. If there’s one thing I know about the justice system, it’s that it’s not perfect, but it can change for the better — and when it comes to issues of domestic violence, we absolutely must change. We must enact laws and policy that ensure better support for victims of domestic violence throughout the judicial process. We must handle cases in ways that are evidence-based, and strive to protect people from offenders with methods that work. We must not simply react to issues of intimate partner violence, but take preventative measures — for example, by ensuring offenders receive appropriate sentences and are held accountable for their actions. We must support the agencies that are working hard to protect our communities, and ensure survivors can gain financial independence from abusers, and have ample access to resources like emergency housing, child care, and legal assistance. We must work to make sure that those impacted by these acts of violence have their stories heard, by all of us, and especially their elected officials. When we don’t take these actions, we fail our community and we fall short of the values we claim to hold dear. Of course, change doesn’t start and end in the halls of Capitol Hill. Domestic violence is not a partisan issue. We need to have conversations in our communities and our families about these situations and their underlying causes. As a parent, I make a point to teach my children about consent, boundaries, communication and being vulnerable. These talks are a key component in getting ahead of a problem that can so easily roll from one generation to the next. These lessons span every intersection of every demographic in our state. There can be no one left out of this often uncomfortable, but vitally important conversation. For the sake of our state, we must continue to speak up and push for change, and work together to create family legacies that are free from the pain of violence. Utah is a place built on values — but if we stand by and allow this epidemic of violence to continue in the homes and personal relationships of our fellow Utahns, we cannot claim family values as one of those guiding principles. Andrew Stoddard is the Murray city prosecutor, Midvale Community Council chair and former victim advocate attorney. He is a candidate for Utah House District 44 which includes Murray, Midvale, and Sandy.